Having painted my first aircraft project myself (RV-8) and being pleased with the results I decided to repeat the process for the RV-3. This time around I used the same materials and techniques as with the RV-8 building on what I learned last time. The full story on painting that plane can be found here. This time around however I ended up painting two planes at once: my friend Randy Griffin's RV-8 and my RV-3. We batched parts when possible and worked together to build as many efficiencies into the process as we could. All told it took us just under four months to paint both planes completely. Griff's plane can be seen here and info on my paint process is detailed below. 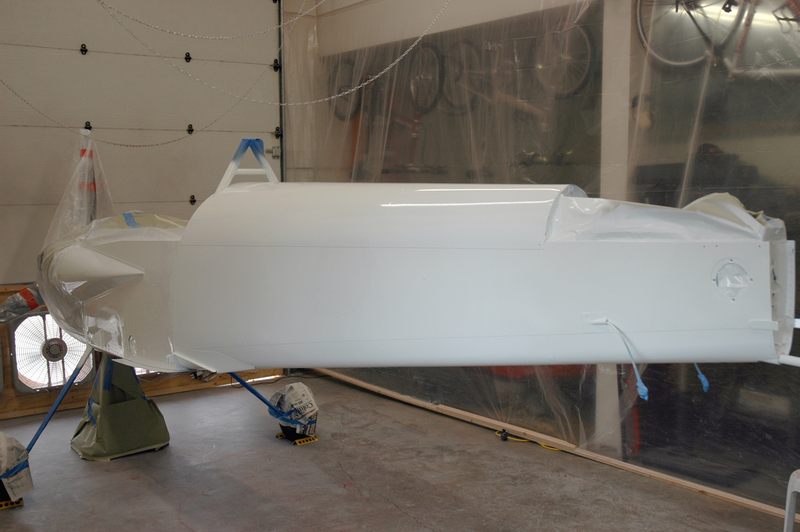 There is always debate among builders about when to paint your plane. You basically have two choices, A) paint it in pieces before final assembly and flight, or B) after it is flying. If you paint it before final assembly you can incur scratches and damage if not careful. Painting it after it is flying requires taking it out of service and at least some disassebly. You also must contend with the surface contaminates that build up from operating the aircraft. Once an RV builder gets his/her plane flying they are generally loath to take it out of service, flying it is just too much fun. I'm a believer in option A and have taken that path now with two airplanes and am glad I did. I believe you simply get a better paint job when all the various parts can be jigged properly and painted separately. With just a bit of care I simply haven't found scrathes or damage to the paint to be a problem. Each builder will choose his/her own path but my advise is to paint it first, whether you do it yourself or transport the pieces to a body shop for the work, I think you'll be glad you did. 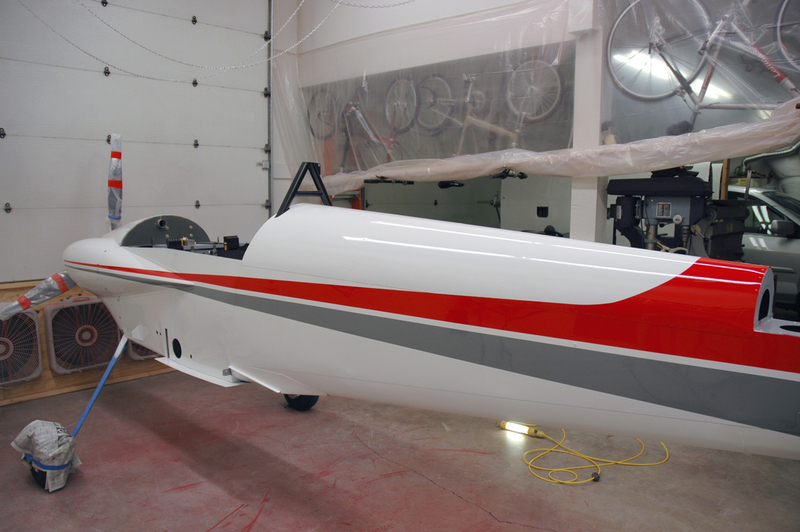 Regarding paint scheme design, I spent countless hours coming up with something I was happy with for the RV-8. Paint schemes are a complicated issue — you want something that compliments the inherent lines of the aircraft, is visually interesting without being too busy, and looks "professional". If you are painting it yourself you also want something that is simple enough that you can do it, yet not be so simplistic as to look home brewed. In the final analysis I was very pleased with how the RV-8 turned out, including the scheme design, so I decided to adapt the design to the RV-3 and use the same colors and materials with the exception of using a slightly darker grey. A computerized rendition of the paint scheme is show below. Anyone knowledgable about paint products will recommend that you stay with one company's family of products... good advice since you then know the complex chemistry with work together. 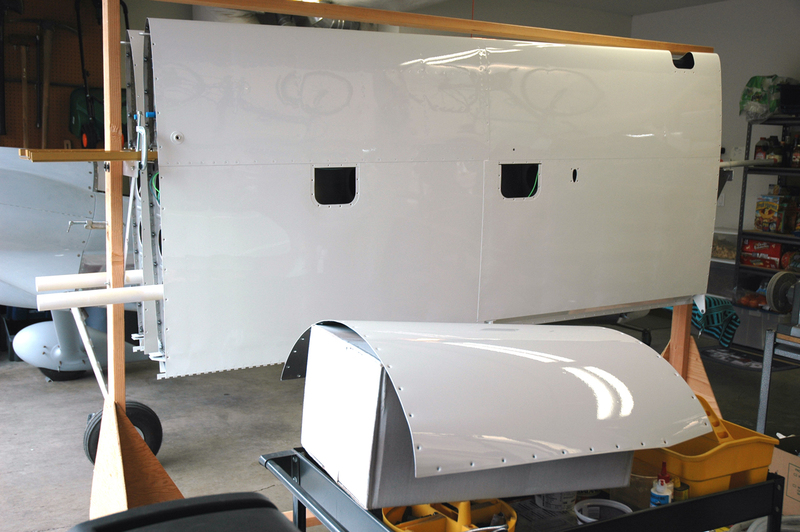 There are products from all the major coatings manufactures that should work for painting an RV. 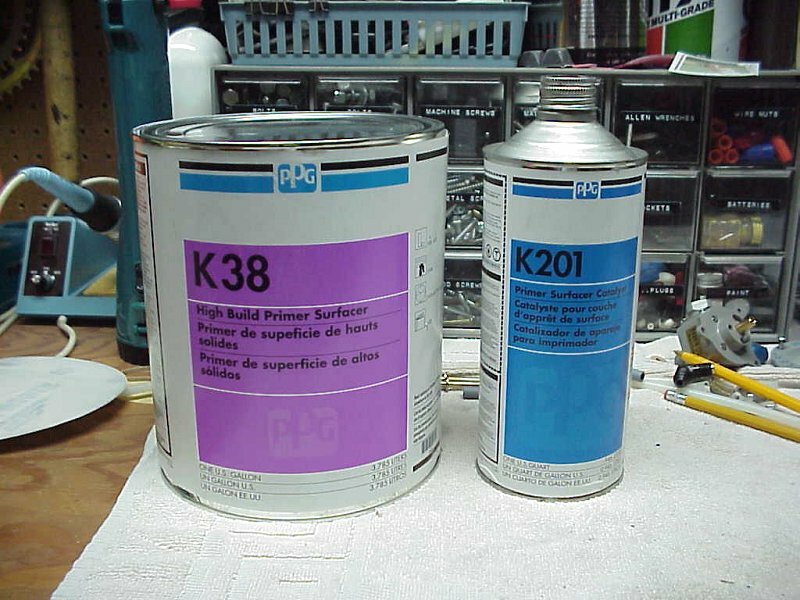 I chose PPG products on the advice of other who have used this family for planes and also on the advice of my local body shop supply store and have been happy with that choice. 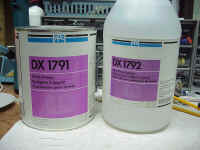 In addition to these materials I used DX685 flattener for all interior paint. The product data sheet lists three different formulas for three different gloss levels. I used the least DX685 which they call "semi-gloss". The two flatter levels are called "Eggshell" and "Flat". By the way, two coats of paint is optimum when using the flattener, you get much more even gloss than with just one coat. 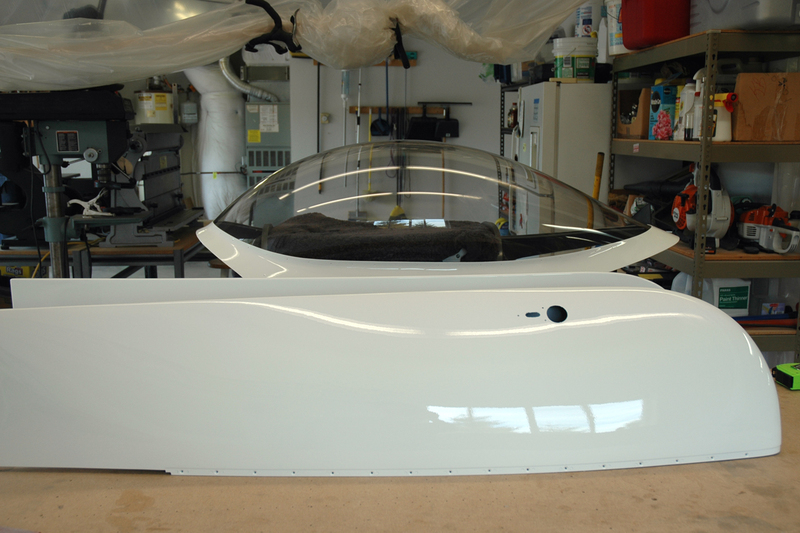 Regarding primer, priming the inside of the plane where it will not get painted (except for the cockpit area) and the outside are two different issues. There is much debate about primer, especially the inside of the airframe where it won't get topcoated. My thoughts and the techniques and materials I used are detailed here. The table to the right lists my paint colors. 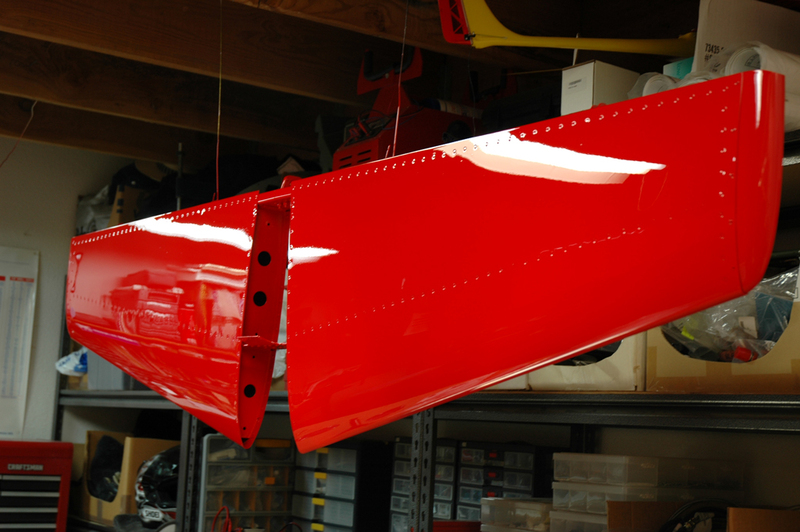 Regarding the red, when trying to find a red for the RV-8 I struggled to find just the right tone and finally ended up with just the pure mixing base so there is no paint color code for it. Most folks like the result, I get compliments on it all the time. The gray trim is a bit darker on this plane than the RV-8. 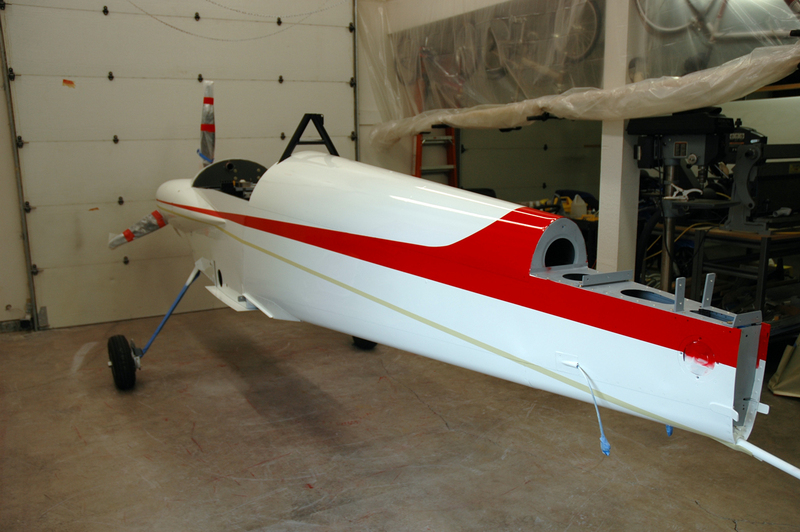 RV-4 builder John Brick copied my RV-8 paint scheme and colors but used 35537 gray instead. After seeing his plane I like it better too... thanks John! Fiberglass prep - Sand all fiberglass surfaces thoroughly with 80 grit (I like Norton sandpaper best). Fill voids or large pinholes with epoxy filler, I used either West Systems epoxy mixed with microballoons or SuperFil, then sand with 80 grit. Use any polyester-based filler at your own peril, it expands/contracts and can crack years later. 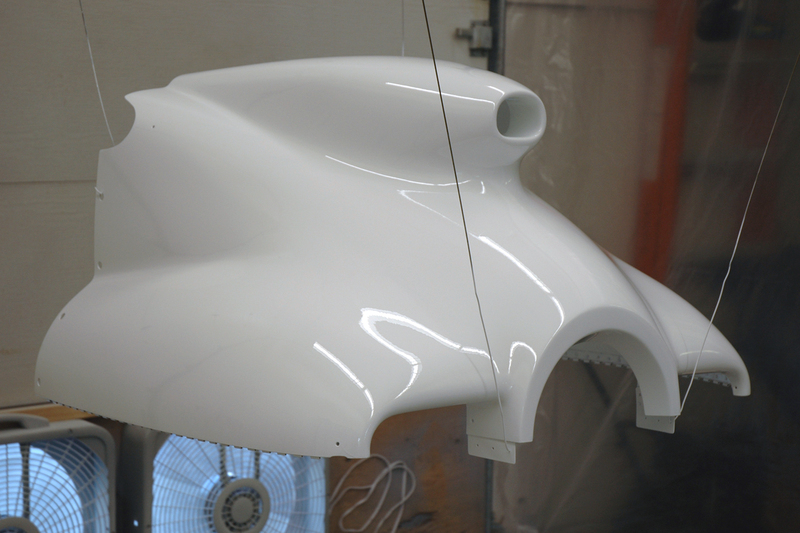 Apply 3 coats of filler/primer, either UV SmoothPrime or K38, sand with 120 grit, repeat as many times as is necessary, usually two full cycles. When all pinholes are filled final sand with 320-400 grit to prep for paint. Aluminum prep - Scuff thoroughly with maroon Scotchbrite either by hand or with DA sander wiping with surface cleaner solvent (PPG DX330 Acry-Clean or equivalent) as you go. Block-sand any high rivets or such with 320 grip paper and a wood block. 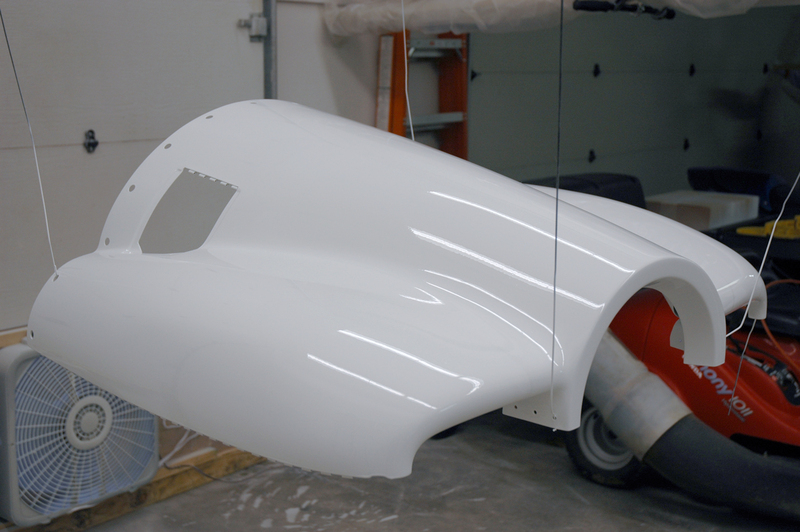 Since scuffing will generally remove the Alclad layer you want to apply primer as soon as possible so as to avoid any oxidation of the now-bare aluminum, usually within 48 hours. 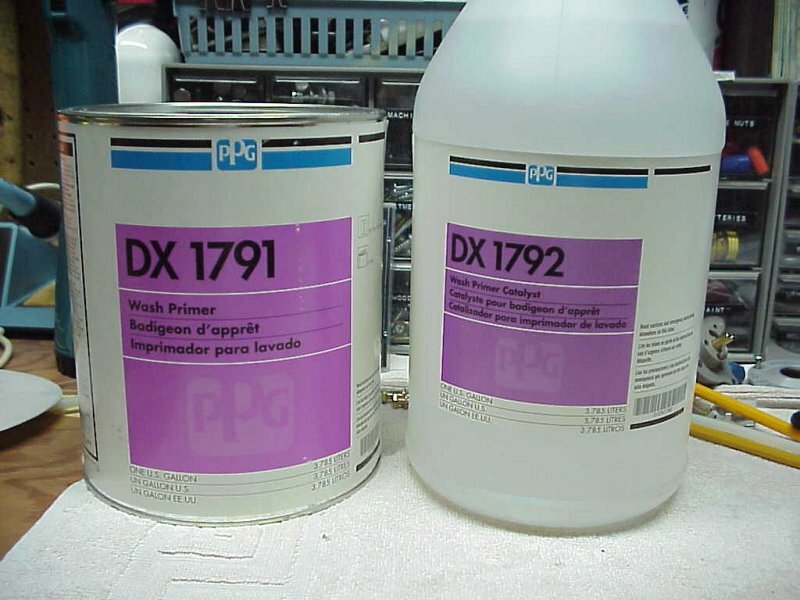 Prime - Apply the DX1791 self-etching primer to aluminum within 48 hours of scuffing. Apply topcoat from 30 minutes to 24 hours after primer applicationn to get a chemical bond. If you wait any longer you'll need to scuff again. 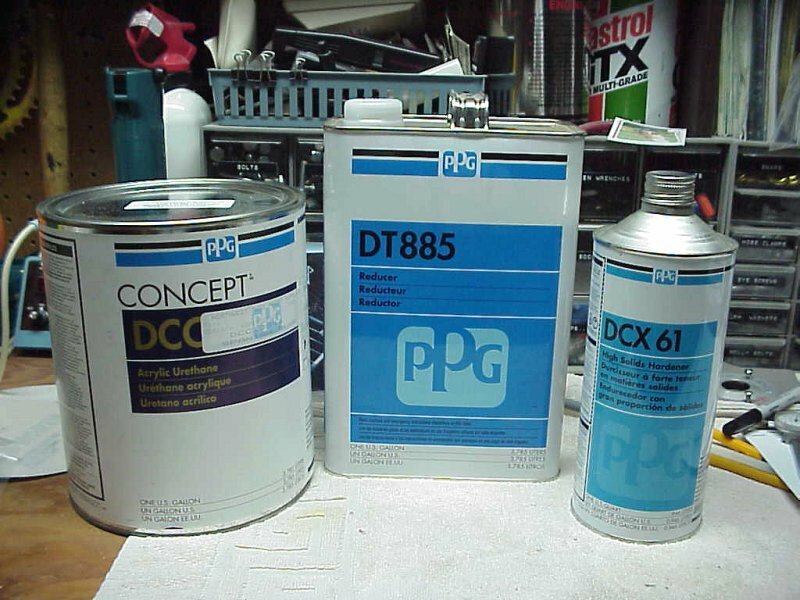 Follow the instructions on the PPG datasheet, 2 medium coats are recommended when topcoating. I found that keeping the gun 12-14" from the surface worked best with this primer whereas painting I found the gun should be 6-8" away. A word about paint adhesion - Paint sticks to any substrate (surface) by one of two means: a mechanical bond or a chemical bond. If possible you want to take advantage of both types for best adhesion. Mechanical bond, or "tooth", is achieved by sanding or scuffing the surface. This increases the surface area and gives billions of little grooves for the paint or primer to "grab". Chemical bond is where a coating chemically bonds with the one beneath it. By first scuffing/sanding all surfaces properly, then priming, then painting within the specified time window you take advantage of both types for the strongest possible bond. DX1791 has a window of from 30 minutes to 24 hours in which the topcoat will bond with the primer. Therefore I always paint over DX1791 within an hour or so to get the best possible adhesion. Paint - For Concept single stage I've found that either two or three coats are optimum. Two coats provides good opacity but usually doesn't always fill as many rivets as I'd like. As I apply a third coat I can see it filling most of the rivets and I therefore paint most experior surfaces with three coats. 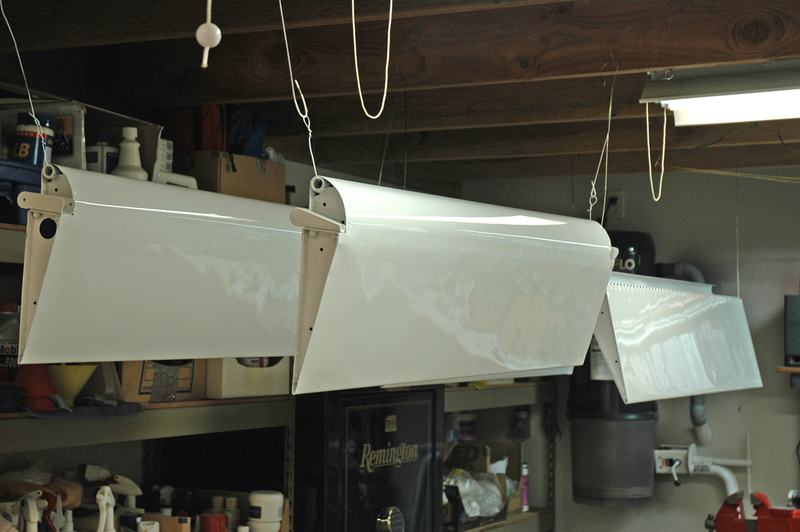 Two coats is fine for the interior or any exterior trim colors. 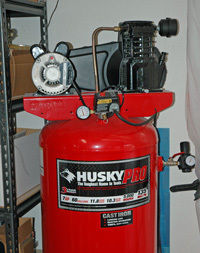 Compressor - I bought a 60 gallon belt drive Husky Pro (made by Campbell-Hausfeld) at Home Depot. It works well and is quieter than the oil-less Craftsman model I had for the last plane. Be advised though, this type of compressor will leak a small bit of oil into the line so proper filtering is a must for paint work. 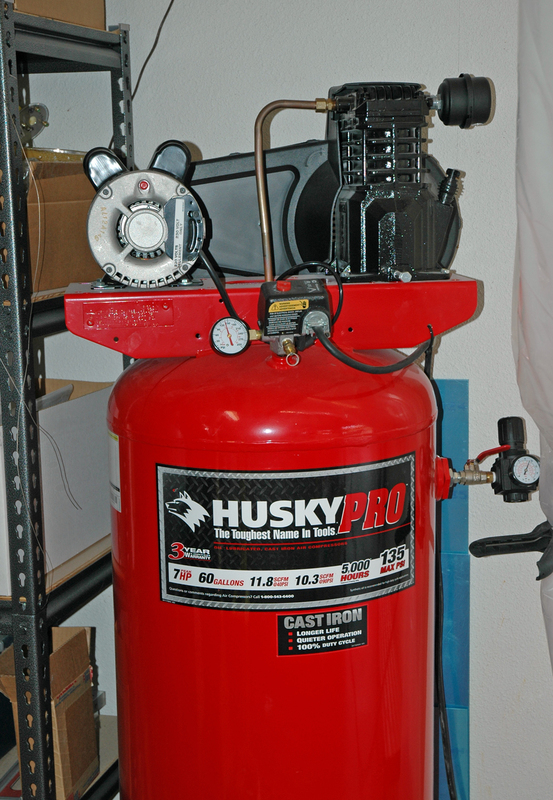 This compressor delivers 10.3 cfm at 90 psi and ends up running about 70% of the time when painting. 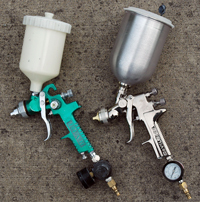 Spray gun - I bought a DeVilbiss GTi-600 to paint my RV-8. That gun has updated to the GTi® Millennium ( GTI-620g) and they have an upgrade kit to update my gun which I bought. It does indeed seem to atomize a bit better using the same 1.4 tip. One of the best things about this gun is the E-Z Liner bladder accessory. The bladders go into the cup and have a ziplock seal. You turn the gun upside down after filling to purge the air and can then shoot in any direction, very handing for shooting the bottom of your fuselage or wings, and also invaluable for shooting aircraft interiors. I also use a cheap Harbor Freight Tools HVLP gun for primer. K38 filler/primer especially is hard on the gun and I don't want to wreck my GTi-620 shooting the stuff. 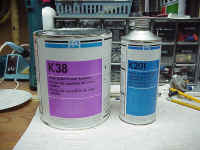 Respirator - Most modern paints contain isocyanates which are highly carcinogenic. 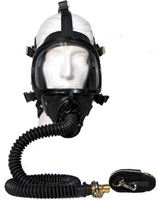 Even the best carbon canister filter respirators will not filter isocyanates out so you need a supplied-air respirator. The most popular of these for the home painter is the Hobby-Air with a full face mask which is what I have. Paint booth - For those who wish to paint there are really two options, either turn an existing space into some sort of paint booth, or rent booth space from a local auto body shop. For logistics reasons I chose to create a homebrewed paint booth. Essentially I just hung plastic across one side and the back of my garage and constructed a "fan board" that I put in the garage door track when shooting (pic coming). I then cleaned all surfaces as thoroughly as possible by wiping the plastic sheeting and using a broom on all walls and lights and repeat that process every couple of paint sessions. 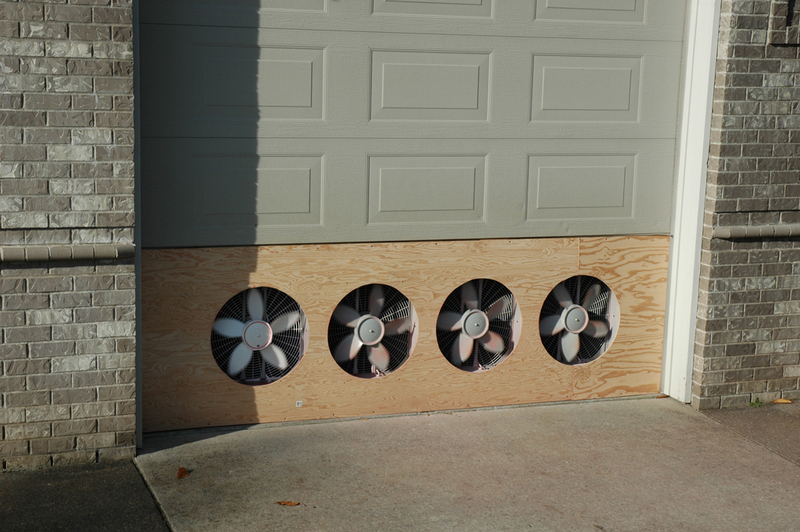 This works fairly well as long as a certain level of ventilation is achieved. For my space I need at least 10,000 cfm to make it work. I've tried it with less and it just doesn't evacuate the atmosphere enough and too much paint fog and resulting dust lingers. If I get 6k cfm or more the fog is evacuated quickly and there is minimal dust on the floor and walls, all of which can be swept up once dry. 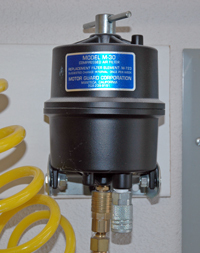 I use no filters for either intake or exhaust and have had minimal problems with dust, and believe it or not the paint fog exiting the fan board doesn't stick to anything including the driveway or shrubs right outside. Ah the wonders of HVLP. Only the best of the 20" box fans that are commonly found around are adequate. I tried some cheap ones purchased from Wal-Mart and they just didn't work. The best I've found are from Lasko. If the manufacturer doesn't list the cfm rating I'd keep looking. Check the Picture gallery for pics of the finished airplane.